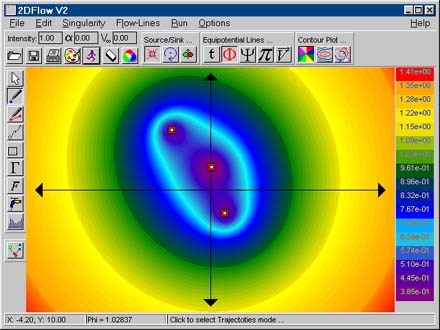 2DFLOW es un programa basado en Microsoft Windows para la visualización de flujos inducidos por distribuciones de vórtices, dipolos y fuentes. 2DFLOW graphically illustrates the use of potential flow theory and has the capability to simulate a wide range of flow problems. Designed for the educational market, 2DFLOW quickly produces graphic representations of many classic fluid dynamics problems which makes it very useful for student comprehension. Used in conjunction with a fluid dynamics class, 2DFLOW can make visualization of textbook theory as easy as clicking the mouse. It allows the user to visualize very complex flows which also makes it a valuable tool for the fluids professional. 2DFLOW uses the Microsoft Windows interface for ease of learning and for user friendliness. The program allows the user to choose the locations of up to 150 singularities by using the mouse or by inputting specific coordinates. 2DFLOW features point and click singularity insertion and can plot velocity vectors and flow contours (equipotential lines, stream-lines, streaklines, and isobars). Any quantity that is contoured can also be graphed along a user defined line. The circulation around a specified point in the flow can also be computed. In addition it allows particle emission and strain-square emission. These features allow detailed analysis of flow fields and enable firm understanding of fundamental fluid mechanics concepts. The program also includes a speed bar for fast access to commonly used functions. Support for 16.7 million colors in the graphical output is included. A number of color-palettes are supplied. In addition the program allows users to define their own palettes. Results can be exported to other MS Window applications.